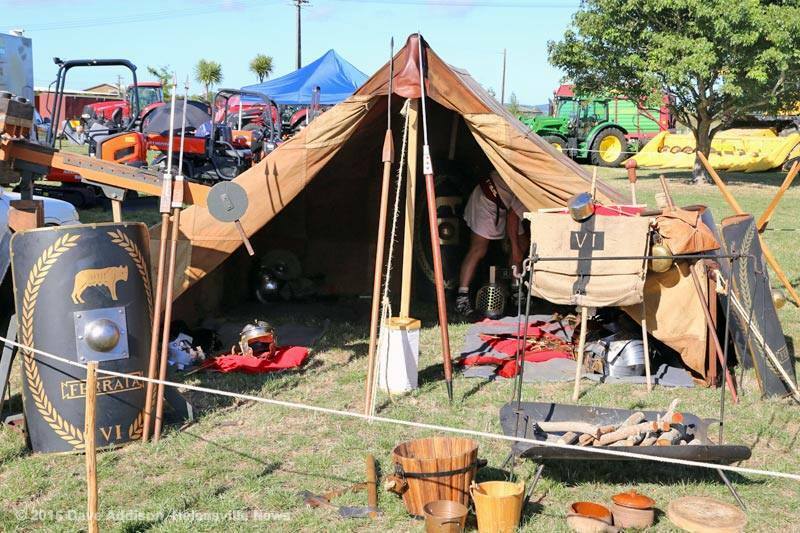 ﻿﻿﻿﻿﻿Imperium-Romana was invited to provide the crowds with entertainment for the Helensville Show. We set up our tents the night before and some members camped over, although the grounds were ably patrolled by the local boy-scout troop. Early morning mist swirled around the Roman camp, making it seem as though we really were on military campaign in deepest darkest Germania! 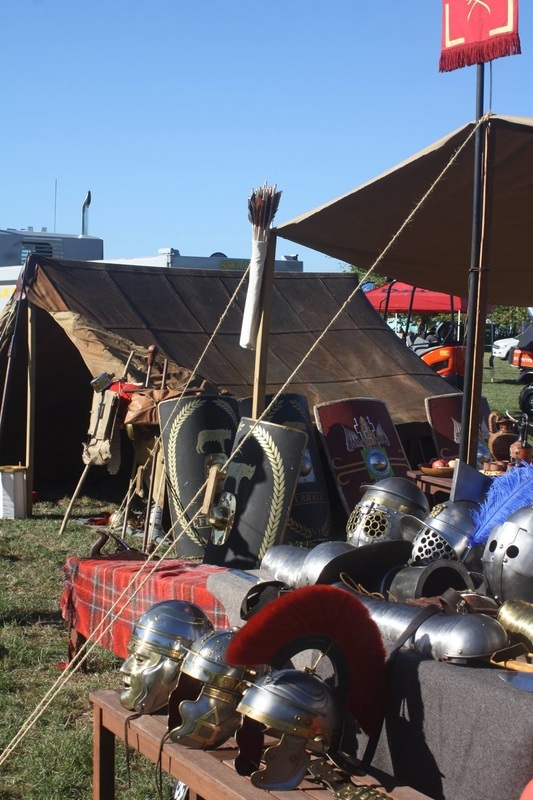 Since we had two shows to perform, the camp always looked quite lively as we prepared, but most Romans still found time to answer the questions of a curious public and demonstrate our gear. The Roman Show began by requesting a volunteer from the audience to join the Roman army, and we were surprised to gain our first female recruit - Samanthaius! She was dressed as a legionary, and proved to be an excellent soldier, well-able to follow commands. Samanthaius did have some trouble fighting the barbarian dummy, so legionary Marius stepped forward and sliced up old watermelon-head in three quick strokes, much to the crowd's delight - but what a mess! "We are a progressive cohort," said club captain Brett Clark, "And Samanthaius has earned her Mars bar!" Our Roman army with short gladius swords advanced against the Greek phalanx with very long spears. 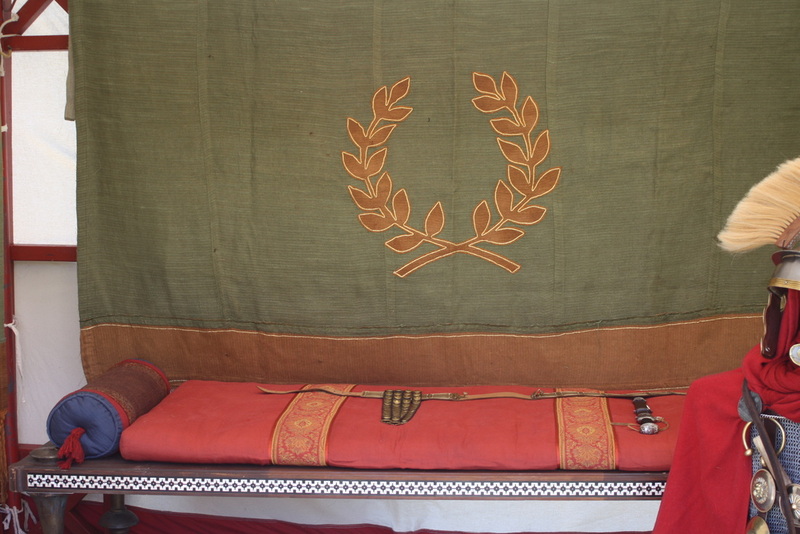 The centurion demonstrated the brutal Roman discipline by beating a slack soldier. We re-enacted the Civil War of Caesar with black shields versus Pompey the Great with red shields in a bloody battle. Then we advanced against the enemy archers in testudo formation under withering live arrow fire until we were close enough to kill the barbarians. 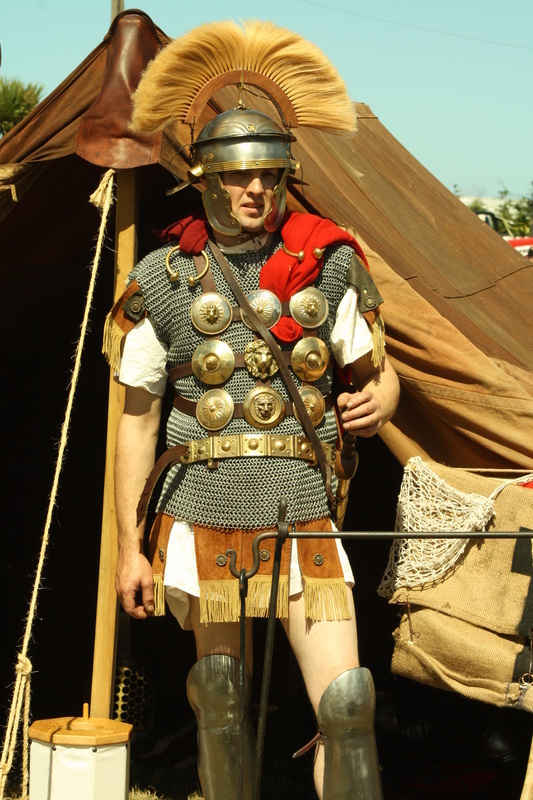 We also gained a new recruit, Benjamin, who saw the article on us in the Helensviile Times and came all the way especially just to see the Romans. He is a theatre-drama graduate and so right into the show side of things. The organiser wrote: "Thank you and everyone else for putting on such an amazing show and display. I have had really fabulous feedback and you certainly generated a lot of interest." She followed up with a thank you card.